Roon 1.6 is a major update to the software, but the most anticipated part is without a doubt its integration with Qobuz. Countless music aficionados, tired of Tidal, have been waiting for this integration for several months. Now that Qobuz is available in the US (beta) and Roon will combine Qobuz content with a user's local content, I have a feeling thousands of people will dump Tidal in favor of Qobuz. Other updates implemented in version 1.6 include a new Roon Radio, new look, and simplified DSP engine. Roon Radio is an underrated feature that I've enjoyed since the day I started using Roon. Like Roon has always done, and similar to Pandora, users can select the thumbs up / down buttons to improve future Roon Radio suggestions. One item of note that may not please privacy enthusiasts is that Roon Radio makes recommendations based on other Roon subscribers with similar tastes. As users listen and interact with Roon it collects this information and uses it for not only to improve your experience but that of others as well. I've reached out to Roon for a comment about what data it collects and if opting out is possible. I'll update this article when I hear back. In the new look part of the update real-time lyrics are more present. These lyrics are something I've come to enjoy, especially when sending them to my Google Home Hub for viewing while I work, even though the audio is still reproduced through my main audio system. No matter how much I like a track, there's always a lyrics or two I screw up and it's important to know Jimi Hendrix was singing about kissing the sky rather than kissing "this guy." Here is the official press release and some additional images. What better way to kick off the new year than with our biggest update yet? Version 1.6 brings the brand new Roon Radio, integration with the Qobuz music service, and an improved user experience across several areas of the application. The update will be available to all users at 12pm EST on January 22nd, 2019. Roon has always been great at reconnecting you with the music you've collected over the years, but now we've completely reimagined how Roon creates your personalized radio experience. Designed from the ground up with new machine learning technology, Roon Radio can play a mix of your favorites along with music from beyond your library, using the vast catalog of music from TIDAL and Qobuz. To get started, click the Roon Radio button on any album, artist, track, or genre from your library, TIDAL, or Qobuz! Roon Radio makes recommendations based on not only your own music preferences but also those of other Roon subscribers with similar tastes in music. Use the thumbs up and down buttons to craft a personal, one-of-a-kind radio experience. As you listen to and interact with Roon Radio over time, it learns more about what you like and helps you discover new music by curating great recommendations. 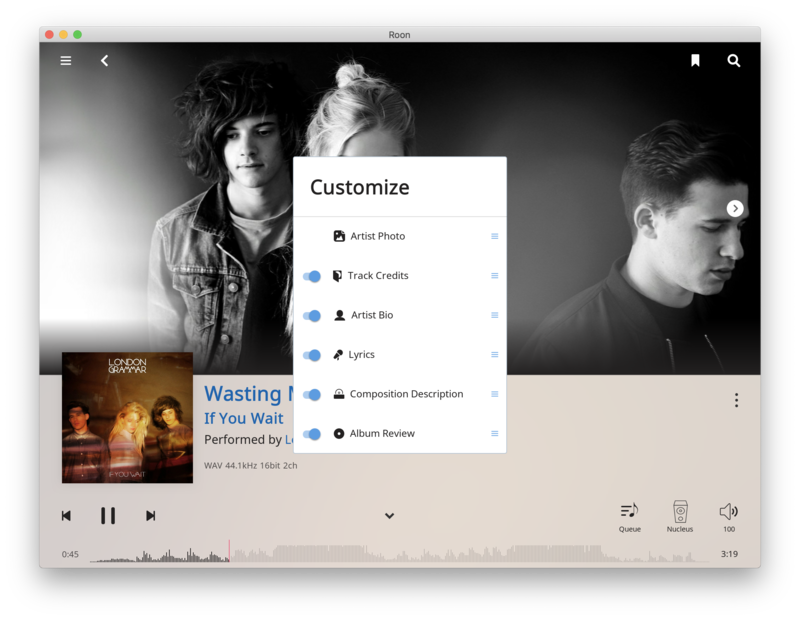 These days there are many ways to get your music – streaming services, digital download stores, and internet radio stations – and Roon supports them all. 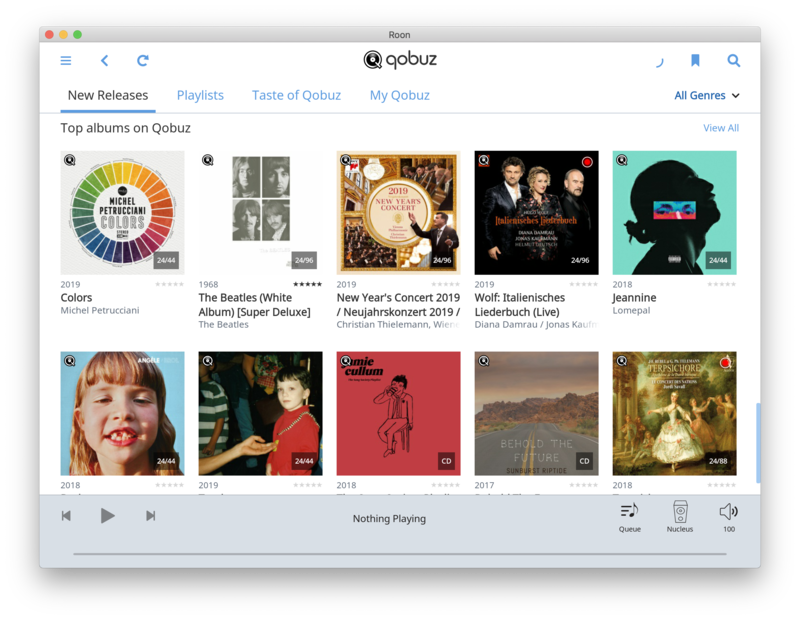 We’re committed to giving Roon subscribers more choices, which is why we’re excited to announce that we’ve teamed up with Qobuz to integrate their streaming offering in Roon! We listen to feedback from our subscriber community, and we’ve really taken that feedback to heart when redesigning several key areas of Roon 1.6. 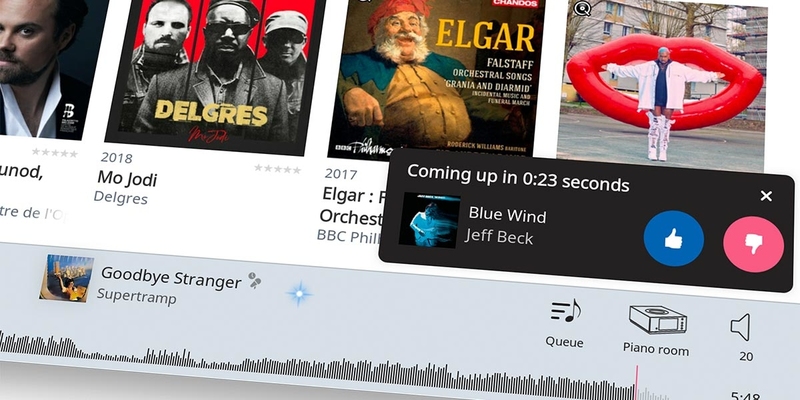 Check out our new Now Playing, Search, and DSP screens for some examples of how Roon is easier and more fun to use than ever. 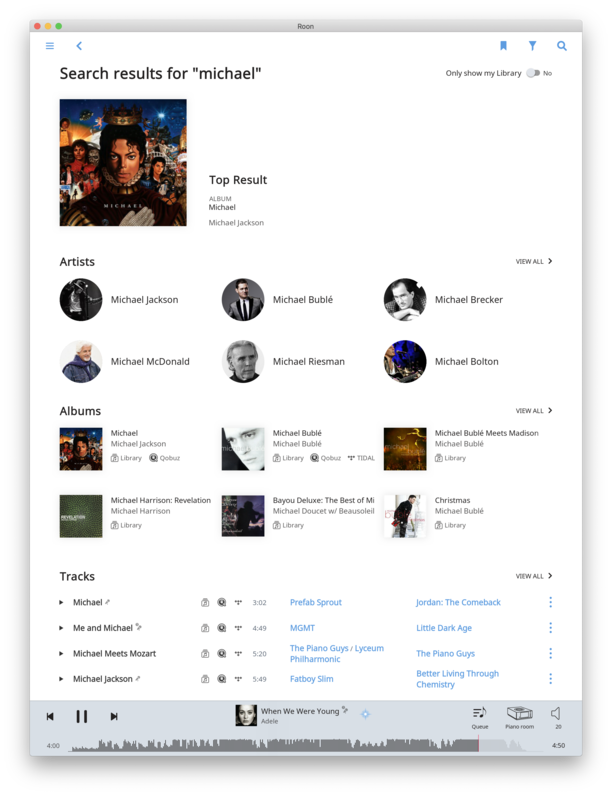 Roon’s metadata takes the spotlight on Now Playing, displaying a high resolution artist image, Real-Time Lyrics, credits, review, bio, and streaming resolution. This number I totally wrong. Reading on Qobuz homepage the number is between 70000 and 75000. And not all albums is available for streaming. Around 90% of that number. 2,000,000 is the approximate number of tracks, as given in Qobuz press releases and stated by Qobuz managers in interviews. The number you found refers to albums, and contains a typo: it is missing a "1" in front of "170,000". The number you quoted later in your post is 175,000 albums, and below I'll address how you get to the number of tracks from there. I arrived at "about 1,850,000 more Hi-Res tracks on Qobuz than MQA tracks on Tidal" by subtracting the approximate number of Tidal Masters tracks I found the last time I checked MQA_List.csv which you can download from the first post here. Also hires is only to be available on the Sublime plan. OK, so 170,000 to 175,000 albums. What is the average number of tracks? About 12? Adjust that by the number of singles and EPs, and we get approximately 2,000,000 tracks. Further it is my understanding you cannot use hires in offline mode. Maximum quality is CD. The "import" feature in the desktop app downloads and plays Hi-Res tracks. I don't know about iOS, but the same feature in the Android app downloads in selectable resolutions and I just did that at 24/96 kHz. The app then played back the album, reporting 24/96. But at the moment, there is a problem. I don't know about iOS, but the Android OS resamples everything that comes out of the Qobuz and Tidal apps to 48 kHz anyway. So regardless of that the app is reporting, the final result is not full resolution. We can get around that on Android by using a third-party app like UAPP, but then you do not have offline mode. Tidal allow up to 5 devices. Qobuz 3. The limit is not installs, but the number playing at any one time. If you really do listen to multiple devices at the same time, you'll need to synchronize them or you'll be getting slightly different timing from each and it will sound off. That requires something like Roon. 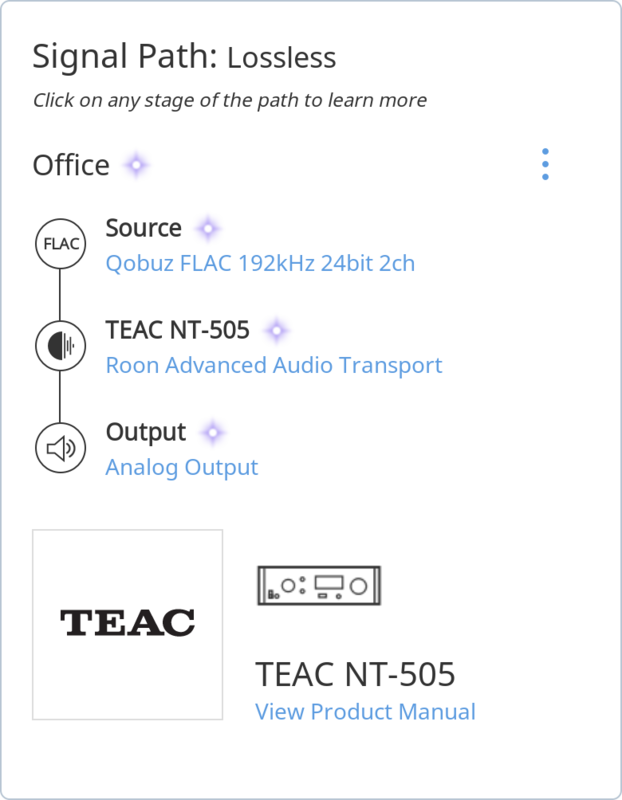 I read somewhere on the Qobuz website that the number of simultaneous Sonos devices may be limited, but I believe Roon, LMS/Squeezebox, and other solutions may be different. I don't recall bumping up against that limit with LMS, but maybe I'll test my limits later. For me Qobuz is for serious sit-down listening on my best systems one at a time. When I have the whole house turned on, I'm usually letting the good folks at Radio Paradise do the DJing for me. OK. Tracks vs albums. My bad. Much of which is from poor-quality remix CDs that sounded lousy even when they first came out. Tidal is fighting a two-front battle, and the big overall numbers are best used for comparisons with Apple Music and Spotify, not Qobuz, HDtracks, or other services focused on quality. The iOS app allows downloading any available resolution you've paid for. So the top tier subscription allows downloading full resolution (e.g, up to 24/192, or whatever they have), while lower subscription levels allow downloading CD quality, etc. You always have the ability to download any albums you've PURCHASED at full resolution. And if you use the camera connection kit to output via USB from your iDevice, it outputs the full resolution - it only resamples down to 48k if you're using the headphone out or connecting to an external device via Lightning port. The iOS allows downloading any available resolution you've paid for. So the top tier subscription allows downloading full resolution (e.g, up to 24/192, or whatever they have), while lower subscription levels allow downloading CD quality, etc. You always have the ability to download any albums you've PURCHASED at full resolution. Thanks. That completes the last three paragraphs of my reply to @R1200CL about offline mode. But has anyone actually tested what the iOS app is doing internally? On Android the Tidal and Qobuz apps appear to be working normally, even when the OS is resampling internal and USB playback. 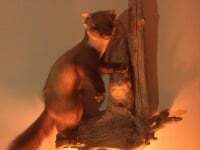 Others have used Android dev tools to monitor this, then posted their results on head-fi. That is one of the reasons I use UAPP. @The Computer Audiophile ...hi Chris , can we please have a face-palm or palm-face option in addition to 'like, thanks, funny ... et cetera' . ? I often have "sync" problems between my Qobuz lib and roon. This am I added 10 albums from Qobuz Mobile, they still dont show in Roon. I added 1 album from Qobuz via Roon, it showed immediately in Qb. There's a difference between having something in Qobuz and having it show up as part of your Roon Library. If you add/favorite something in Qobuz, it will show up in the Qobuz tab in Roon the next time that refreshes. If you want it to show in your Roon Library you need to click " add to library", it seems.